Wake Forest Law will confer its highest postgraduate law degree, the Doctoral of Juridical Science (S.J.D.) degree, for the first time this month. 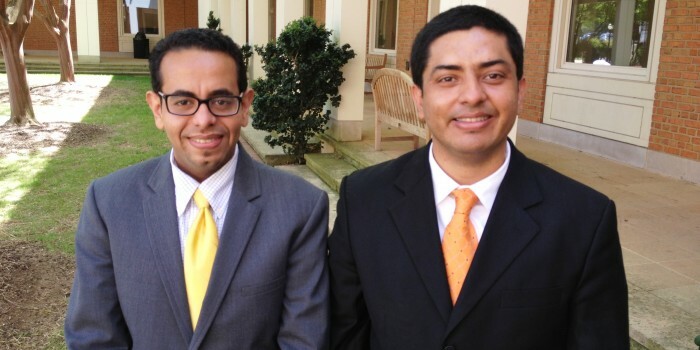 After years of rigorous research and writing, Mohamad Basam of Saudi Arabia and Joel De Leon Quintero of Panama will receive their S.J.D.’s on Monday, May 20. The S.J.D. program is designed for international attorneys and United States LL.M. graduates, who are pursuing academic or high-ranking government careers in their home countries. Wake Forest Law developed the S.J.D. program “because we had a number of students in the LL.M. program who really wanted to deepen their studies, and they felt strongly that Wake Forest would be the best place to do it,” explained Professor Richard Schneider, associate dean of International Affairs. The law school’s inaugural S.J.D. candidate, Basam, was no stranger to Wake Forest. After earning a Bachelor of Laws degree from King Abdulaziz University and working as an Assistant Teacher at the Institute of Public Administration (IPA), Basam graduated from Wake Forest’s LL.M. Program in 2007. Before returning to pursue an S.J.D. degree, Basam worked as a Lecturer and Coordinator of the Legal Programs at the IPA, where he taught government employees and young lawyers insurance law, contracts, administrative law, and legal writing. Basam was also a part-time Legal Consular at the Saudi Ministry of Defense. Basam’s S.J.D. studies were sponsored by his employer, the IPA. The law school’s second S.J.D. candidate, De Leon Quintero, received a Bachelor of Laws degree and a Master’s degree in Criminology from the University of Panama. He also earned a postgraduate degree in Higher Education at the Specialized University of the Americas and an LL.M. degree at the University of Notre Dame. As a member of the Panamanian Bar Association, De Leon has worked for the Panamanian government for twelve years to fight corruption in the positions of Executive Assistant to the Accountant Attorney General, Assistant in the Electoral Prosecutor’s Office, and Assistant in the Anticorruption Prosecutor’s Office. De Leon’s S.J.D. studies were sponsored by the National Bureau of Science, Technology, and Innovation of the Republic of Panama. Unlike the LL.M. Program, which is a course-oriented degree, the S.J.D. Program is directed towards scholarly research and candidates are expected to produce a dissertation of publishable quality that contributes in an original manner to the area of law to which it is directed. To guide Basam and De Leon in their research, each was assigned a faculty adviser from the law school who has expertise in their dissertation topics. Sharing his interest in criminal law, De Leon was matched with Professor Ronald Wright. Wright was more than happy to work with De Leon because he found his proposed topic on corruption to be “extremely interesting” and was eager to advise a student on a “more advanced level.” De Leon found Wright’s guidance invaluable. “I was fortunate to have an adviser who had previous work experience with my topic [and] is very familiar with the legal system in Central America,” De Leon said. To culminate their years of research and hard work, Basam and De Leon defended their work to their dissertation committees, along with other faculty members and law students, at the end of the spring semester. As he approaches graduation, De Leon is excited about his future professional life. “An S.J.D. degree opens many doors,” he explains. De Leon plans to return to his work fighting corruption for the Panamanian government and will continue teaching as a part-time professor at the university level. De Leon will also help the organization that sponsored his studies interview new applicants who want to pursue postgraduate degrees in the U.S.
Basam plans to return to the IPA as a better law instructor. “I learned from Shapiro many methods of teaching to and reaching students [and] how to present the information in a comprehensible way,” he said. For more information about Wake Forest University School of Law’s S.J.D. program, go to http://sjd.law.wfu.edu/.